The lack of shading to describe relief indicates that this is an outline drawing: the half-way stage between the original projection and the finished drawing. Towyn appears towards the bottom left of the surveyed area. Individual buildings are depicted in red ink, indicating they are made of stone. Trigonometrical stations are marked by a dot within a red triangle. At Taren Gadian, pencil lines can be seen radiating from the trigonometrical station, indicating the angular measurements the surveyor took from these points. 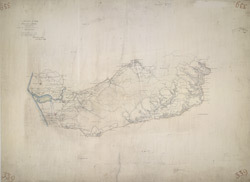 A triangulation diagram on the reverse of the drawing enabled the draughtsman to plot topographical features precisely.